What Does Poverty in America Really Look Like? 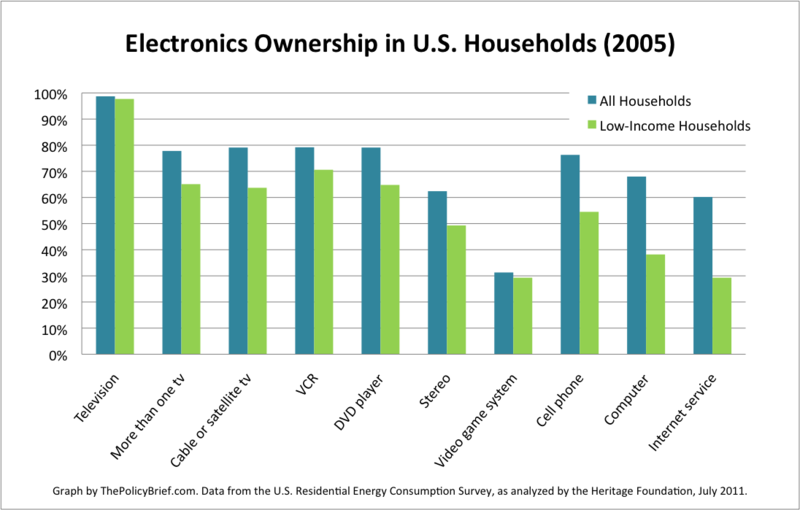 In addition, low-income families aren’t that far behind the rest of America in terms of owning non-essential electronics like stereos, computers, DVD players, and even video game systems. Looking at this graph and knowing that one-fourth of Americans have no emergency savings sort of makes you question where everyone’s priorities lie. But quality of life is about a lot more than whether you have a coffeemaker or dishwasher in your house. Heritage’s purpose with all of this is to call into question our definition of poverty by demonstrating that low-income families in the U.S. are living much better lives, in some ways, than most people in the rest of the world and throughout U.S. history. Extreme material deprivation is no longer very common in the U.S., which is something to celebrate. Instead of taking this to mean that poverty isn’t a problem anymore, we should recognize that our current challenges are less visible and harder to fix, but no less important. What poverty in America really looks like is poor health outcomes, lower life expectancy, reduced educational opportunities, higher rates of crime victimization, and a host of other challenges. In other words, there’s still plenty to be concerned about. Furthermore, even though the vast majority of low-income families in America aren’t homeless or starving, the number that are is not insignificant. The data Heritage cites in its report show 1 in 68 poor people are homeless on any given night and 6% report instances in the previous 4 months when there wasn’t enough food to eat in their household (more recent USDA statistics show slightly higher rates). In a country with a GDP of $47,000 per capita, which puts us on the worldwide top ten list, the fact that this kind of stuff still exists at all, no matter how rare, is depressing. Air Conditioning, Cable TV, and an Xbox: What is Poverty in the United States Today? This entry was posted in Economic Policy, Issue Framing and tagged Poverty by Diana Brazzell. Bookmark the permalink.